Champagne and Socks » Other things? What other things? September 2 Other things? What other things? I can’t believe it’s Friday already. This week has been one of those weeks where work has been full on and then I’ve followed the day of deadlines to a night of working hard or getting home late to only get an hour or two in before bed and all of a sudden it’s freaking Friday. And September. I don’t have anything interesting to report. I think I recorded about nine billion podcasts this week and wrote and edited and all kinds of being on the grind stuff. This weekend is very jam packed too and then C is off to the east and I will be without him I have plans though for that period of time, which I will reveal and track when he has gone. Meanwhile, tonight I was catching up on some knitting during Galactic Suburbia (in that I unpicked the same row over and over during the 2 hours we recorded. Sigh) and I remembered that I hadn’t posted about my current projects for a while. My goal for knitting whilst on the field trip was to knit myself a pair of socks. I knew we would be doing a lot of driving so I knew at least that time would be available but I forgot how much people faff about (doing what, I do not know. I am actually very speedy and streamlined when not at home). So … I managed to get this much done whilst I was away. 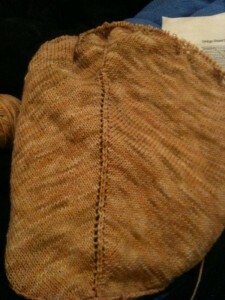 I’d knit the first cuff previously. 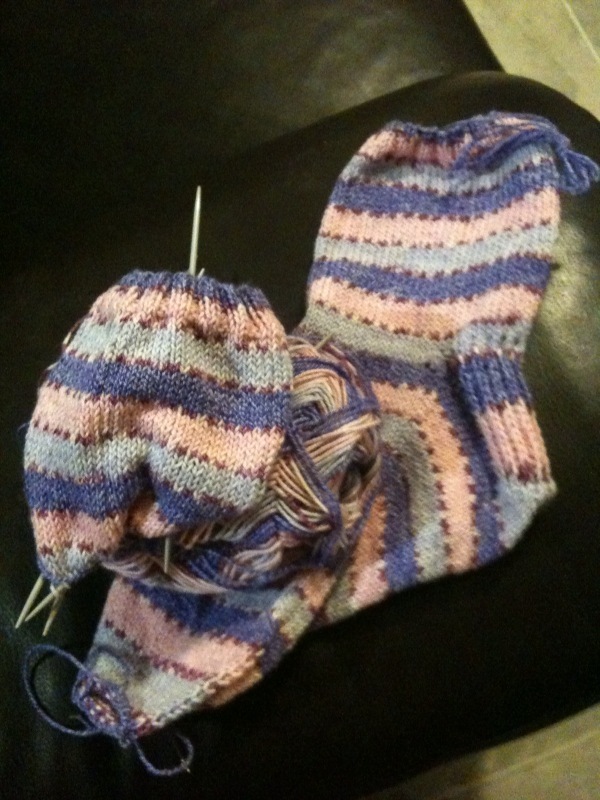 I got the heel turned before we had left the Perth metro area and cast off the toe before I think we left to come back home at the end of the three days. I quite liked knitting socks in the car and I’m thinking I might have a project like this on the go for grabbing when we hop in the car, since for us most of our Perth stuff means a two hour commute. And when I say, “have a project like this on the go” I mean, *cough* progressively work through the various sock project I currently have on the needles. Maybe. I’m a bit excited about these because I bought about three balls of self striping yarn way back when that was all the rage, like 6 or 7 years ago and I only ever got round to knitting myself one of these pairs. It’s a mix of fibres with a bit of nylon through it so, can go in the wash like a normal pair of socks and wears quite well. The Shawl. I decided in the end to unravel the project I had. I just did not like what it was looking like. And then I cast it back on in this yarn – Latte by Sophie’s Toes. I’ve knit the shawl basically and am now working on the lace border which you can glimpse at the top. I added a repeat to each side of the centre because I knit it up first off with the recommended stitches but thought it was too narrow. So this shawl in the end has been quite a trial to get to the end of. I hope it ends up being pretty.